Hello friends! Hope here! It's been a while since I've blogged, but I'm back and here with a list of 12 Things I Love About Christmas! 1. I like to make the cookies for Santa. 2. I like making Christmas cards for all of my friends. I make each one special. 3. Waking up on Christmas morning and feeling the excitement rush through my body! 4. Decorating the Christmas tree. 5. I like my advent calendar and the fun prizes and activities. 6. Finding the elves on Christmas morning after Santa hid them. 9. Reciting the Christmas story on Christmas eve at church. 10. Making the reindeer food and putting it out for them. 11. Giving the gifts that I have picked out or made for each person I love. 12. Handing out Christmas cards. What are your favorite things about Christmas? I have lots more! P.S. Can you tell my sister was crying in that picture above? She doesn't love Christmas pictures. Awe your list is perfect! I love it! I love giving at Christmas, I love to see others smile! I love when you can tell people have holiday cheer! Your pictures are too adorable! Such a wonderful (and adorable!) list! 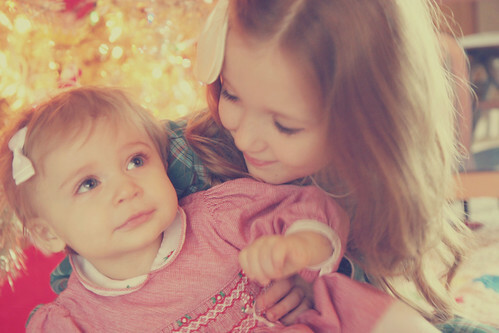 <3 I love the photographs of your two beautiful girls too! Your list ist just perfect. What a great list! And I love those pictures. You make a great big sister. Gorgeous pictures! And it's nce to know that your favourite things about Christmas are more to do with giving gifts than receiving them - good girl! In Holland, we have Sinterklaas (Saint Nicolaus) on the 5th of december. That is when we make stuff and give presents. At christmas, we mainly come together with family, eat (a lot) and think back over the year. So a lot of things out of your list are not common here, and reading them makes me want to do them to! Maybe this year I'll give some homemade gifts and start a tradition! such happy christmas things! beautiful beautiful christmas girls too! This was such a great list! Great list, Hope! I love making the cookies for Santa, too. We used to feed the reindeer by putting carrots in our sneakers. :) Merry Christmas!! you and your little sister are beautiful!!!! and what's even better than being pretty on the outside?? being pretty on the inside!! and you are both, merry christmas !!! wonderful list and beautiful pictures! Your Christmas dress is perfect by the way! sweet happy christmas list. i always like to see photos of your darling daughters! they are precious. this is the best christmas list, with the cutest pictures to match! You and your sister are adorable. That's an awesome list. I love all of those things too! My sister and I are planning on taking some pretty fun Christmas pictures with our kitties pretty soon! P.S. I love your dress and bow! Very cute, little miss. Awesome post, Hope! YAY for leaving Santa cookie's and his reindeer some food. I'm sure they're hungry after their journey. :) I love reindeer!!! I also love Christmas morning... I have a hard time sleeping the night before. The excitement I feel is so fun, though! Oh and I love Christmas picture taking as well!!! You and your sister are so cute. ; )) Nice Christmas list and beautiful pictures! Those pictures are the cutest! What great memories. hope! your'e so cute! we all love the same things as you do... the excitement doesnt fade with age :) the picture of you and your sister is so presh! These photos are the cutest! They are mini version of you and you hubby! those photos of the kids came out beautifully! the girls are so darling and this list is so sweet! Great list. Your girls are so adorable. I just had a girl myself. I love the way your girls dress. Hope seems like such a fun little spirit. what a great list! my favorite thing about Christmas is making fudge - it's a super-secret family recipe. My mom, sister & I all know it by heart! I also love to watch the movie White Christmas. I'm glad to see you back, Hope! I've missed you. 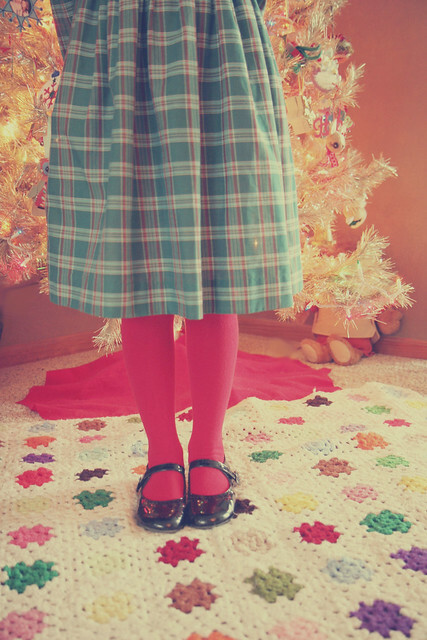 :) You look so pretty in your Christmas dress (so does Poesy!)! Some of my favorite Christmas things: curled up on the couch in the dark with just the Christmas tree lights and a candle or two; Christmas cookies! ; church on Christmas Eve; getting out all my ornaments and decorating the - every ornament has a story; getting cards in the mail; opening stockings. These photos melted my heart a few nights ago when Katie showed them to me. I had to come and comment. Such a great blog post Hope! I can't wait to see you all in a month!!! Wait is that teddy ruxpin OMG I had one !!!!!! Saw it peaking under the tree. Classic !!!! !